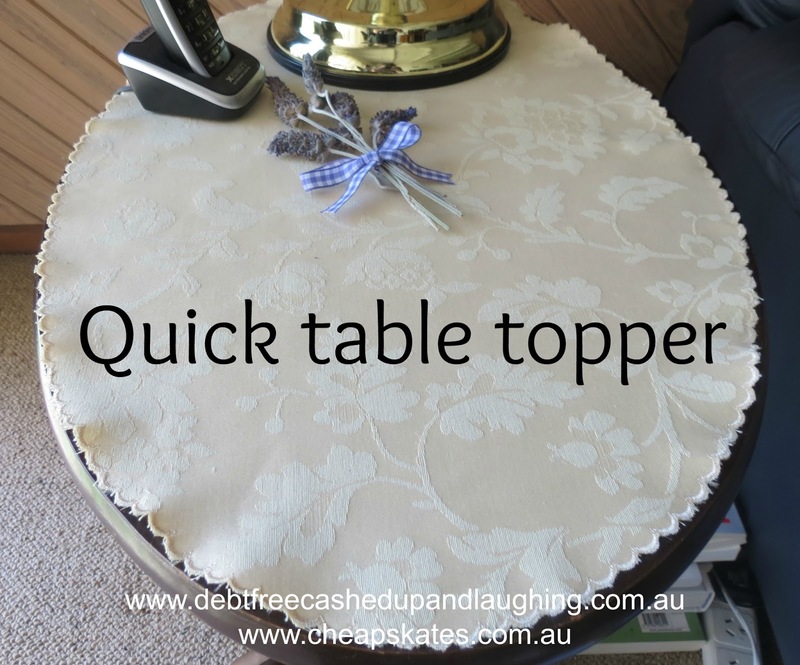 I set the sewing machine up to make some Christmas presents and while it was out I made a new topper for a side table in the loungeroom and some new doyleys to match - cost $0! The fabric was scrap furnishing fabric given to me a while ago by my cousin. This past week I've been concentrating on finding the holes in the stockpile. All those things I/we use but not a lot of or not regularly. Things like bandaids, sunscreen, herbs and spices, yeast (how did I miss that one? ), scrub buds, eucalyptus oil, baking powder, citric acid, gelatine - all essentials in my household but not used every day or even every week in some cases, so easily left off the shopping list. Wayne reconnected the watering system he made for me so I can get just the plants watered too. He used recycled and hard rubbish bits to put it together last year so it has cost us nothing but it saves me time watering and being on a timer it will save water; it has little drip thingys over just the plants that need water so nothing wasted. I crushed more egg shells and sprinkled them around the plants to deter snails and slugs. Planted more lettuce. Staggering planting gives a constant supply all summer. Collected water from the kitchen and bathrooms and tipped it into the washing machine. Started watering the back grass with the grey water from the washing machine now the weather is warming up (we don't water grass otherwise). Dried carrots. One kilo of carrots, dehydrated, fits into a 500g jar. Dehydrated carrots, 1 kilo down to this! Went through my fabric and pattern stashes and have decided on gift ideas to make. Cut out and stitched some Christmas presents. Recycled some shopping bags to use as gift bags. Recycled a couple of boxes to use as gift boxes. Combined any errands with taking Hannah to the station to save on petrol. Filled the car up on Tuesday using a 4c off docket. Kept the windows, curtains and blinds closed on Monday and Tuesday when it was so hot to keep the house cool. Cooked all our meals - breakfasts, lunches and dinners - from scratch at home this week, except for Thursday's lunch which was Mum's treat. Spent $19 at Aldi to top up milk, cheese and bread, that's all we needed this week. Made some cards using materials from the craft stash. And that's about it. Just normal stuff that we do every day, without thinking, that helps us live debt free, cashed up and laughing. You have a great list Cath. The tasks might seem ordinary but can save extraordinary amounts of money over time. Would love to see a photo of some of the gifts when they are finished ( or after Christmas ). I think we forget that 'ordinary' is good. When things are ordinary there's no stress, like is chugging along as it's meant to and all is right in our worlds. Sometimes we use the word as a derogatory term and I think that's what confuses us. We've become to believe that if something is ordinary then it isn't good, and that's just not true. Wow Cath, you had a great frugal week!